I haven’t eaten an Easter egg in years. Easter was always one of my favourite holidays and I remember going on egg hunts and eating all the chocolate as a child. As time went on however two things happened: 1) I became vegan and realized that my options for shop-bought Easter eggs were severely limited, and 2) I discovered that most vegan eggs are seriously sugary (I think it’s overcompensating for the lack of milk) and don’t often taste of much else. Each year I say I’m going to make my own eggs, and each year I bail on that promise. But when you start writing a food blog it turns out you can’t get away with that anymore. So this year I had to bite the bullet and get recipe-testing. 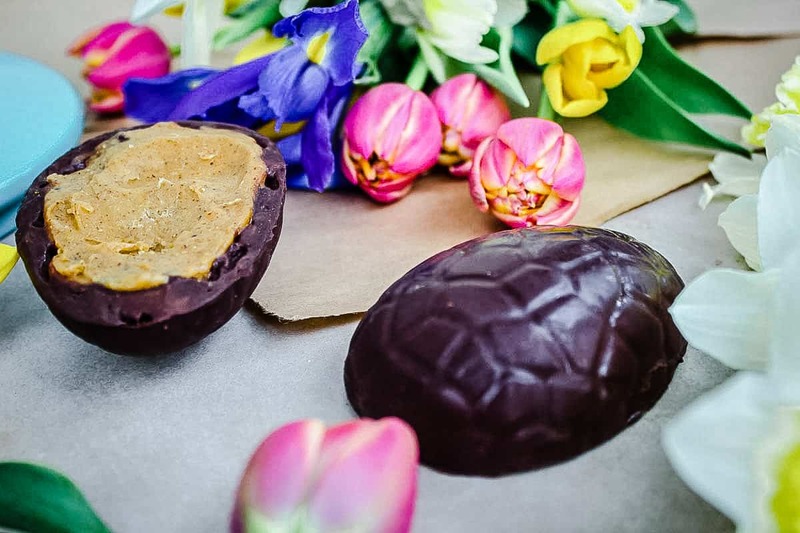 And Vanilla Almond Caramel Easter Eggs were the result! They’re a little fiddly to make but it’s worth it because it’s so much fun to see the end result. Also, I’ll be honest: these eggs are RICH. So much so that I’d recommend making lots of little ones rather than two large eggs, as they are a bit much to eat in one go. Two notes: if you’re thinking of using coconut oil instead of cacao butter – don’t! Coconut oil melts at a much lower temperature so the eggs won’t stay solid for long. Also, the taste is just much richer with cacao butter, and less coconutty. And finally, you can choose whether to use cacao powder (raw) or cocoa powder (non-raw). Cacao has more health benefits (as long as you don’t heat it too much) but cocoa tastes a little less bitter, and a little more like the traditional chocolatey taste most of us are used to. Have fun! 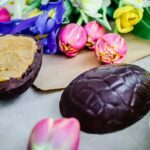 These vegan, gluten-free and refined-sugar-free Easter Eggs are rich, delicious and decadent without being full of sugar! Make the chocolate first. Melt the cacao butter and maple syrup in a saucepan on a very low heat for about 10 minutes, until the butter is liquid. When melted, remove the saucepan from the heat and whisk in the cacao powder and vanilla until fully combined. Allow the chocolate to cool for 15-20 minutes. Using a pastry brush, brush a layer of melted chocolate over the inside of your half-egg molds. Place the coated molds in the freezer for 2 minutes to set, then repeat the process. You will probably end up brushing on about 6-8 layers, until you get a chocolate shell thick enough that it won’t break. When this is done, place the egg molds in the freezer while you prepare the caramel. To make the caramel, simply whisk all ingredients together in a bowl until combined and silky. Remove your molds from the freezer and spoon the mixture into each half (ensuring that you only fill up to the top of each – do not overfill!). Return the molds to the freezer for 20 minutes, to allow the caramel to set. 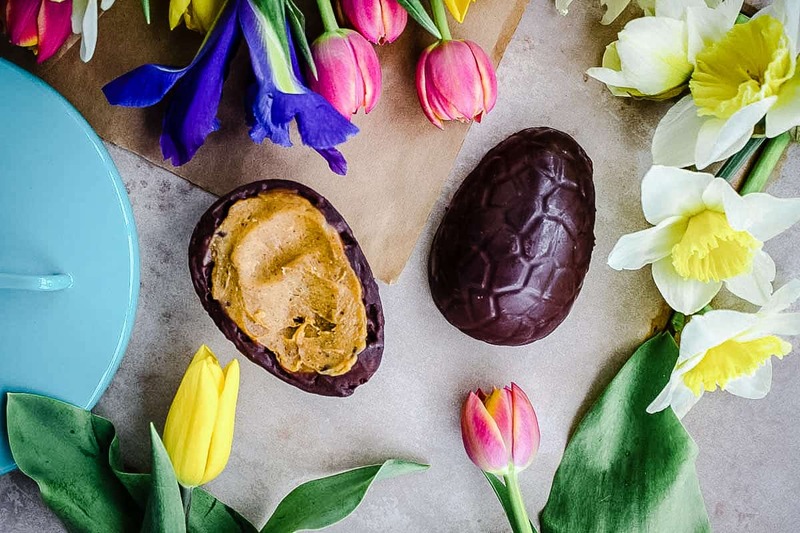 Remove your eggs again from the freezer, and using a flat knife that has been dipped in boiling water, run the blade around the edge of each half egg to melt the chocolate. Gently (really gently!) press two halves together, holding them until the chocolate sets. Continue the process with each egg and then return them to the fridge for 5 minutes to fully set. When making the caramel, it's important that your liquid ingredients are room temperature. Too cold and they will harden the melted coconut oil! There's no substitute for the egg moulds, but they're pretty easy to find. All good cookware shops should have them.